Your pet's Kaos adventure starts with trained pet care specialists attending to your pet's needs in our modern boarding facility. We offer the highest pet-to-staff ratio of any facility in the area! The kennels are attached directly to the Meyer home. Yes, Kaos is owner operated. Paul and Mandy personally oversee your pet's care daily. Mandy is a certified veterinary technician. Your pet's well-being, safety and care are evident in every aspect of Kaos, from the kennel design to the caring adult staff. Heat, air conditioning, music, T.V. and night lights along with smoke and carbon monoxide detectors keep everything cozy and safe inside. 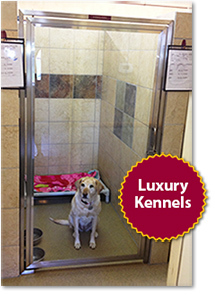 Kennel accommodations include your choice of either luxury or traditional kennels. Outside 40 acres are here to be explored with adventures in the fields or ponds. Explore the walking trails that wander through the property or play a game of fetch in or out of the water. Large grass fenced yards give every dog a chance to exercise outside. 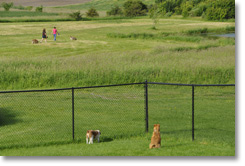 We are one of the few boarding kennels that feels like your yard and the dog park combined. We are proud to offer your dog huge grass yards, fresh air and sunshine. Additional services including extra outside yard times, packages, activities, baths and "Happy Hours" are all available. We hope to meet the varied needs of all the pets that are entrusted to our care. Toy and small breeds will enjoy the amenities of the Luxury Apartments. Solid enclosed tile walls on three sides with a glass front provide the extra security our smallest companions need. Unobstructed views in and out of the Luxury Apartments compliment the small dog experience. Elevated cots and fleece beds keep your small dogs extra warm. Kaos offers specialized care for puppies, seniors and medical needs. Many veterinarians refer their clients to Kaos for pets with both non-medical and medical needs. The diverse background of staff includes veterinary technicians, biologists and trained pet care technicians. We have a veterinary technician on staff or on call 24/7. Click on Reservations to reserve your pet's boarding dates and accommodations. Your Choice of Traditional or Luxury. 6' x 3-1/2' size with music 24 hours. Chain link front doors with private sides. Orthopedic beds and blankets provided. — One Dog: $31 per day. — Two Dogs: $56 per day. — Three Dogs: $81 per day. Glass front doors with tiled private sides. Orthopedic beds & blankets provided. — One Dog: $36 per day. — Two Dogs: $61 per day. — Three Dogs: $86 per day. 6' x 6' size with music 24 hours. — One Dog: $44 per day. — Two Dogs: $69 per day. — Three Dogs: $94 per day. 10-14 day stay 10% off boarding price when you add on any package. 15-30 day stay 15% off boarding price when you add on any package. Sorry there are no discounts during any holiday stays. If your pet checks out between 8 a.m. and 12 noon Monday - Friday. or 8 a.m. - 10 a.m. Saturday and Sunday there is no charge for that day. Each reservation includes 2 exercise sessions outside in grass play yard. Pets that share accommodations must be from the same family.